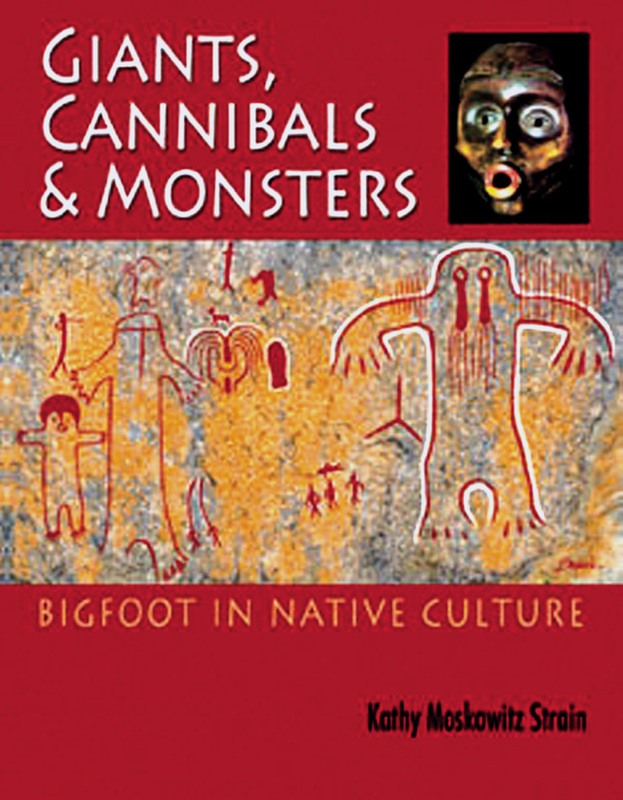 First Nations Sasquatch References Gallery - Sasquatch Canada contains current and authoritative information on sasquatch and other homins. 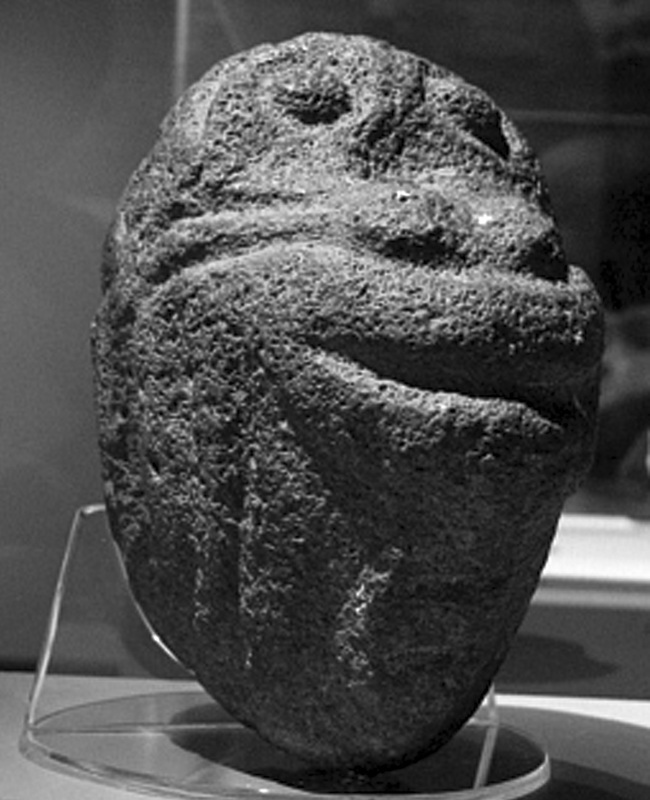 One of several stone heads said to show an ape-like creature. The first two images (top) on the right show the foot, from below and above. 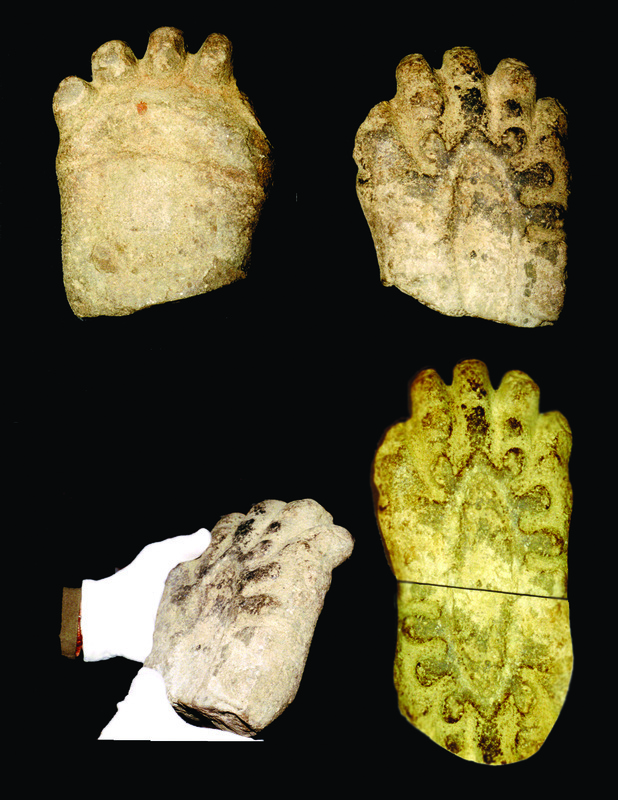 The third images shows the foot in the hands of a lady museum curator. The last image shows what the complete foot possibly would have looked like--the bowl portion on the front end has been duplicated, placed upside-down on the lower end, and the toes deleted. The length of the foot is about 8.8 inches, as is. Adding the lower portion, a shown, would make the total foot about 12.3 inches, although there may have been a more extended heel. Aboriginal people arrived in North America at least 10,000 years ago. 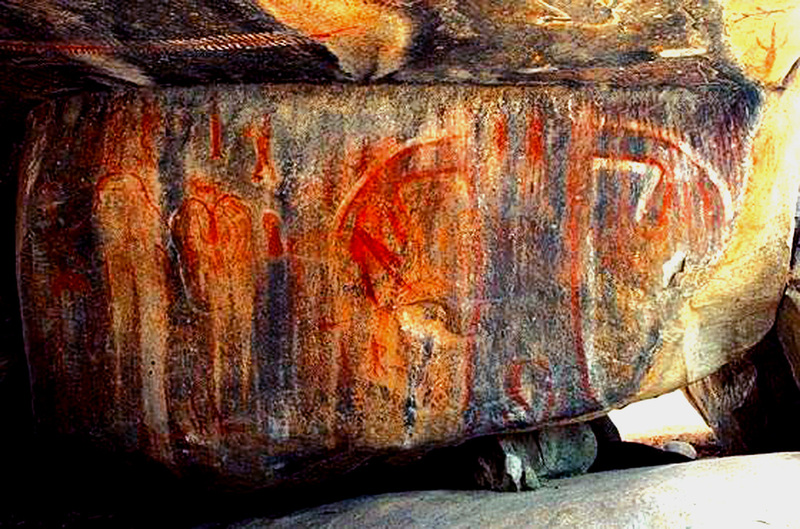 As with people throughout the earth in all times, they created artwork. 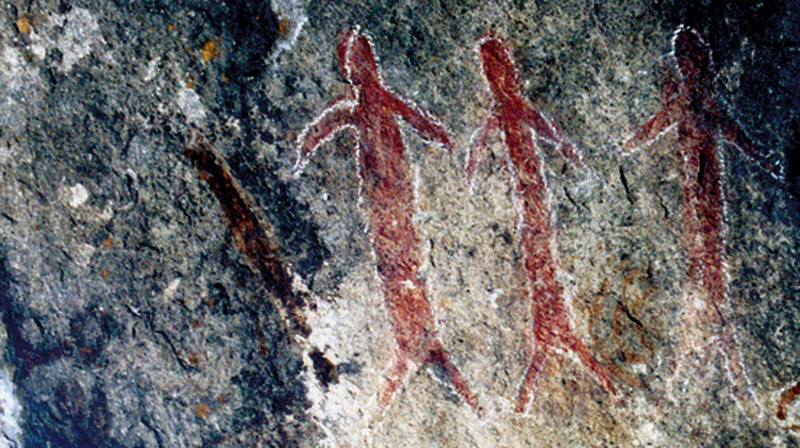 Images generally depict animals, humans, and various designs. Stone head of a bighorn sheep. 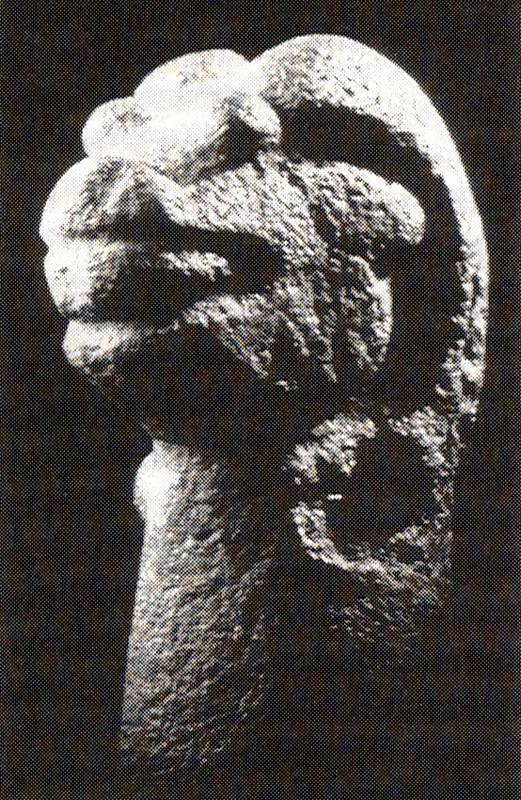 valley created a number of stone heads. 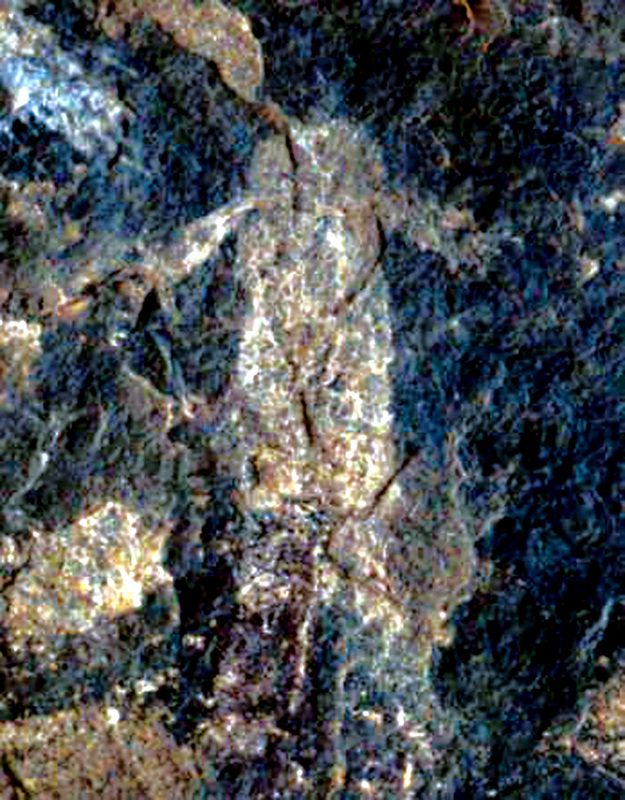 A petroglyph in California that Native people say is the “hairy man.” Descriptions provided for the “hairy man” and a pictograph (rock painting--see First Nations Pictographs section) of the creature match the descriptions we have of the sasquatch. people in British Columbia. Could it be that the images were created as a warning that the creature inhabited that region? 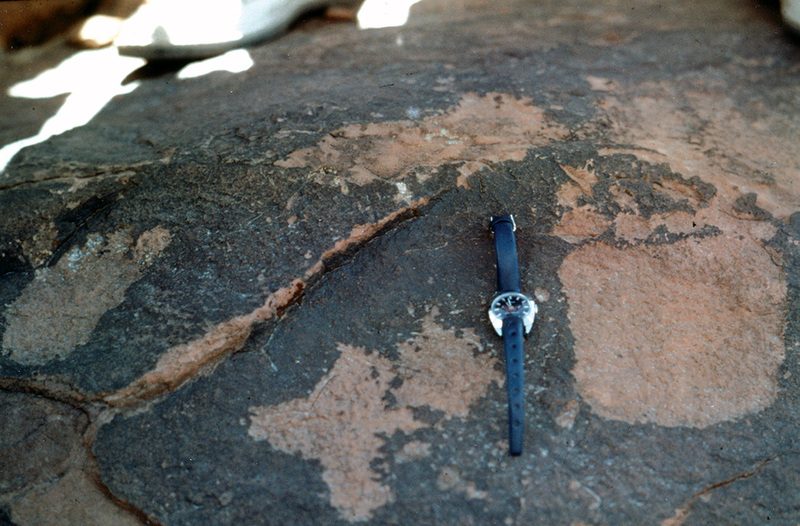 The second photographs shows footprints. 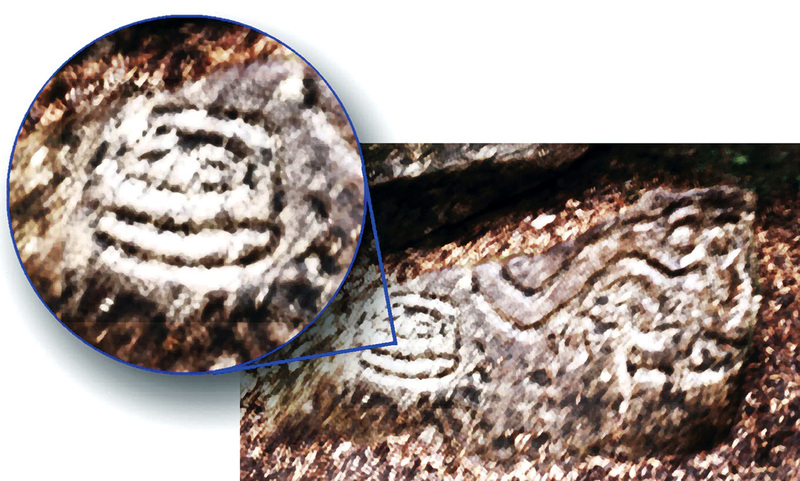 The print on the right is similar to the stone foot (see First Nations Stone Carvings section). 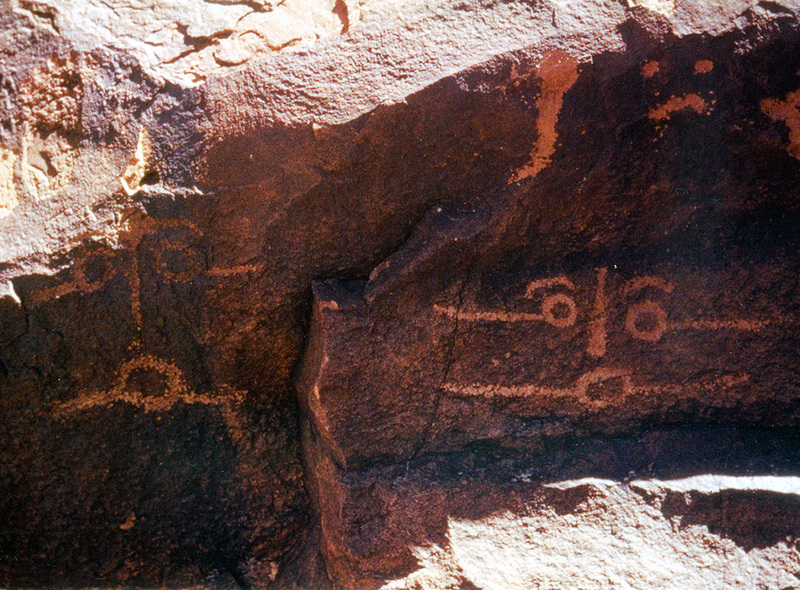 pictographs are in central California. that correspond with what we know about the sasquatch. 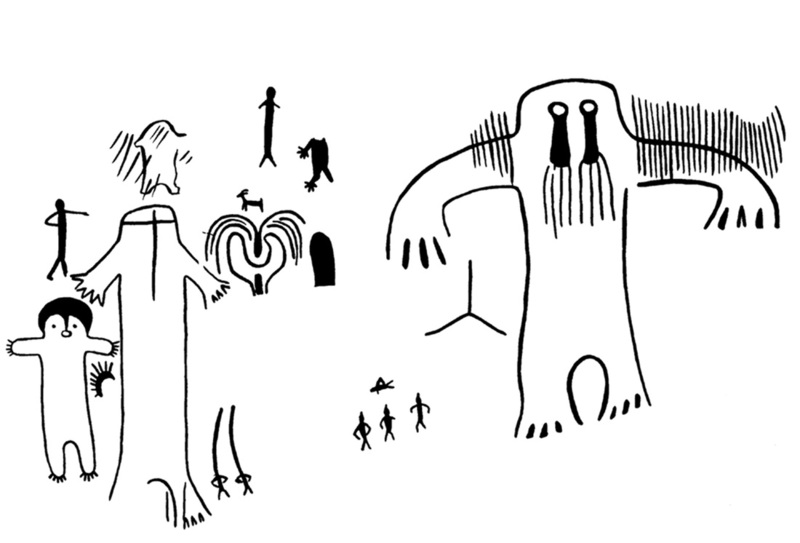 There appears to be little doubt that, real or mythical, the hairy man and the Pictographs showing humans at the same site as the “hairy man” image. A distinct difference is seen. 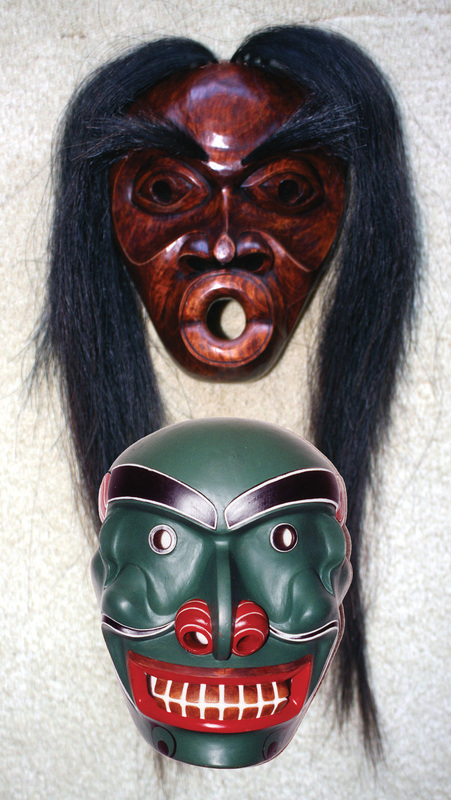 A D’sonoqua mask (top) and a ‘buck’ was mask depicting what we have come to call a sasquatch. 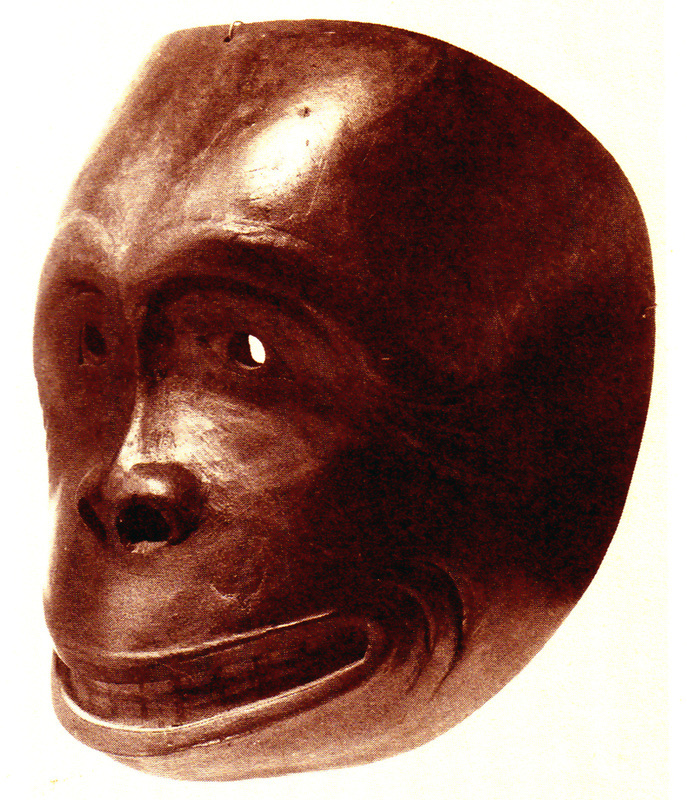 long before non-Native people took an interest in the creature.